If you’ve been to any Disneyland anywhere in the world, then Downtown Fort Collins, Colorado, might look familiar. Disney’s Main Street USA was partially modeled after the picture-pretty historic center of this northern Colorado college town. Restored 19th-century brick and red stone buildings, mansard roofs and lacy Victorian ironwork highlight streets filled with eclectic shops and art galleries, craft breweries and pubs, and more than 80 unique restaurants, bars, and cafes. like the F.Miller block, giving it a real Main Street USA look. It’s a town with a hip and happening vibe, huge civic pride and a lot going for it. Downtown Fort Collins puts on more than 100 days of free events every year. Yes, there’s a lot to do here. And you really should go do some of it. I spent an afternoon in Downtown Fort Collins recently with family. We ate and drank, walked and shopped, enjoyed the historic architecture and learned about single-origin chocolate. We were all charmed enough to want to return. During my Colorado visit, I stayed with family, but if you don’t have that opportunity, a great option is to rent one of many beautiful private cabins in Colorado. Check them out and stay in private luxury. Fort Collins is famous as Colorado’s craft beer epicenter. In fact, it’s been called the “Napa Valley of beer.” There are more than 20 craft beer breweries in town, and a few of them are right in the historic downtown. Whether your taste is for India Pale Ale or amber, wheat ale or stout, you’ll find a very good example of it here. We had our first taste at Coopersmith’s Pub & Brewing, directly across Old Town Square from the Visitors’ Center. It’s a great place to start your exploration of Downtown Fort Collins. It’s the longest-operating brewery in town with a wide range of brews available. I especially loved their Poudre Pale Ale. 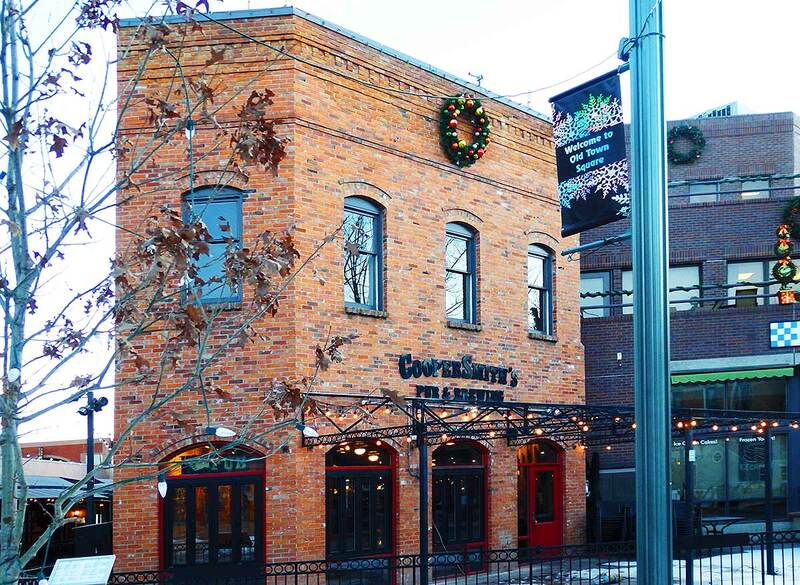 Coopersmith’s Pub & Brewery is right on Old Town Square, the happening heart of the neighborhood. 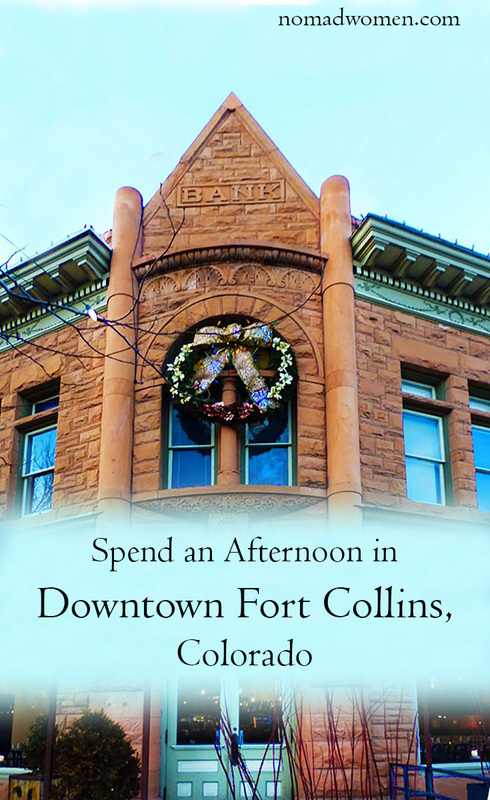 Besides all that great beer, you’ll find that walking, window shopping, and browsing the boutiques and galleries is the #1 recommended activity for an afternoon in downtown Fort Collins. As you stroll, you’re likely to come across more than one gaily painted upright piano. The program “Pianos About Town” rounds up donated instruments and asks local artists to transform them into unique pieces of street art. They are there for anyone to play. Pull up the whimsical metal chair and set your fingers flying across the keys. The program “Pianos About Town” has placed donated pianos, custom painted by local artists, on the city’s streets. On the right is “Octopus Octaves” by Ren Burke. Pull up the chair and play! More than a dozen art galleries invite you to get your art on in Old Town. One of our favorites was Trimble Court Artisans (118 Trimble Court), an artist-operated co-op of fine art and craft. The more than 50 co-op artist members also staff the gallery, so a visit is even more interesting. They show very high-quality work in jewelry, ceramics, painting, fused and blown glass, fiber arts (like the simply delicious painted silk scarves by Susie Hardy), metal work, and other media. 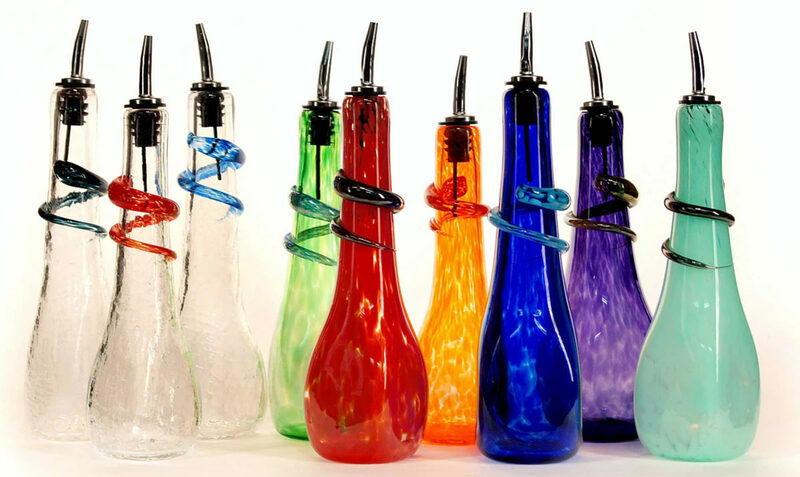 I loved these hand-blown glass bottles by Dottie Boscamp at Trimble Court artists’ co-op. Too bad I was traveling with just a carry-on bag. 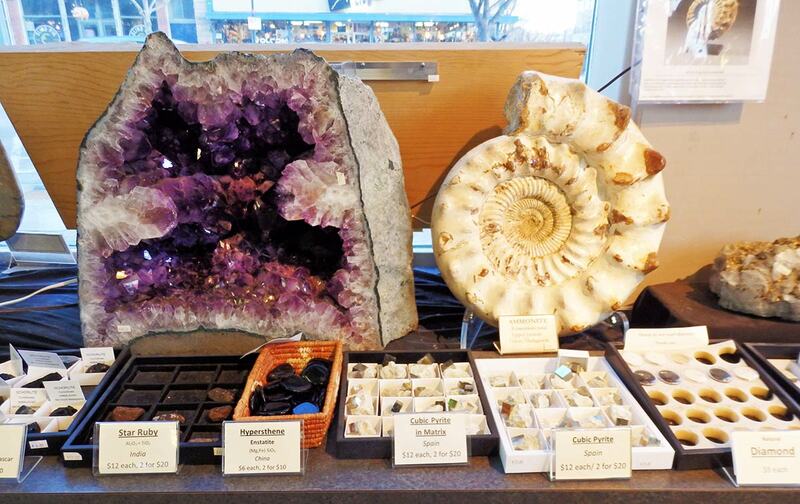 and other science and nature items at Nature’s Own. Next we browsed through the delightful Ten Thousand Villages (113 Linden St.), a non-profit store staffed by volunteers, with amazing displays of fair-trade crafts created by artisans in developing countries around the world. The range of items offered is staggering, a veritable mall of the hand-made world. Journals to jewelry, skincare to stationery, baskets to bags of every size and shape. And all at very fair prices. If you can’t find something you need and covet here, you’re not looking closely enough. Shopping is all well and good, but we were a group of serious cooks and foodies. 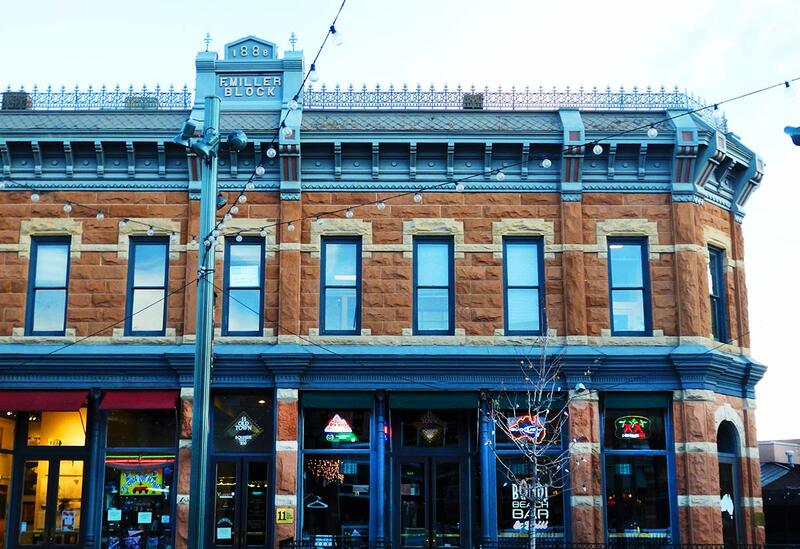 What did Downtown Fort Collins have to offer us? The answer: a staggering banquet of tastes, textures and tools, sweet and savory flavors, and delicious libations of every variety. Of course, we needed to stop for coffee. Fort Collins is a college town, home to Colorado State University. And where there are college students, there is sure to be good coffee and a lot of it. The “third-wave coffee” movement has made great inroads here. We had lots of fine choices and settled on Bean Cycle Roasters (144 No. College Ave). They’re major roasters as well as having an on-site café. After we sated our need for caffeination, I bought a 12 oz. bag of freshly roasted Ethiopian beans, which turned out to be some of the best coffee I’ve ever had. 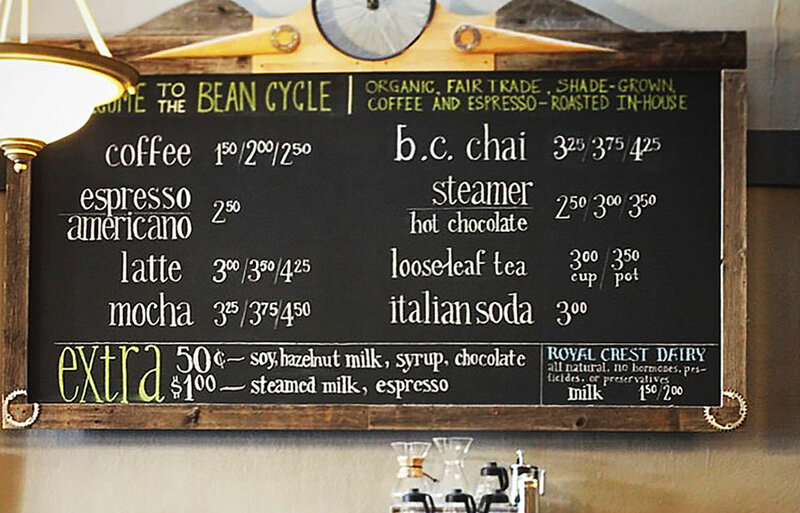 We had rich, deep-flavored, fair-trade coffee at Bean Cycle in Fort Collins. All the serious cooks in the group went a bit wild in a few shops. Savory Spice Shop (123 College Ave.) hits your senses the minute you walk in with its heavenly fragrance. Just about every herb and spice and blend you could want is here, lining the shelves. They specialize in mixing there own custom spice blends for rubs and sauces and pre-measured packets of single-serving spice blends for recipes they provide. If you’re not vegetarian, don’t miss the Chicharron salt. It’s like nothing you’ve ever tasted. Down the street at The Cupboard (152 S. College Ave.) you can pick up any and every kitchen gadget you could want. You can even bring your dull knives in for sharpening. Upstairs, browse through a huge selection of cookbooks. and perhaps the best chocolate shop I’ve ever entered. My niece had the Ecuador sipping chocolate and described it as “like a chocolate bar you can drink. Not too sweet.” It is actually made with half a bar of chocolate melted with heavy cream. My other niece ordered a “flight” of bar chocolate. It came in small, star-shaped bites of six different flavors, with printed cards describing each one, a nice way to compare types. Having thus finished a wonderful dessert, we decided we should probably have dinner. We walked around the corner to The Welsh Rabbit Cheese Bistro. And oh my, what a wonderful decision it was. If Nuance is all about chocolate, this place is all about cheese, and anything that makes the cheese even better… like wine, olives, warm baguettes with balsamic drizzled olive oil for dipping. We ordered salads and a wooden platter of cheeses with some meats. 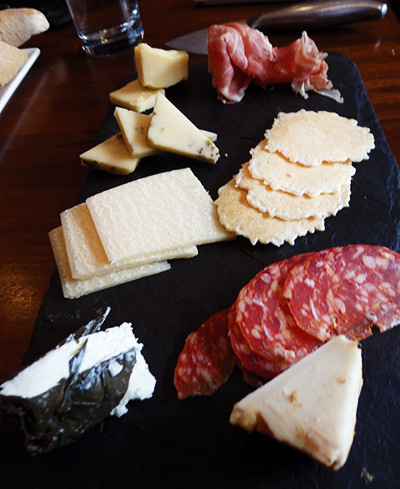 Our shared cheese and meats platter at The Welsh Rabbit. 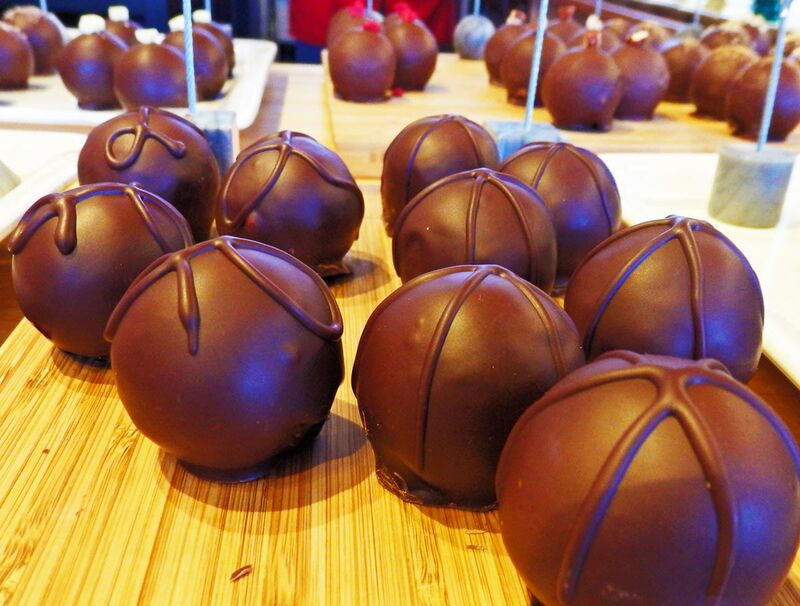 Every single bite was wonderful. Samples we tried included Lavender Cheddar with embedded lavender buds; Apple Cinnamon Chevre Spread with small bits of apple on top (my favorite of all my favorites); a Parmesan-Reggiano that was mild at first bite but developed its flavor in your mouth. We also tried the Powerful Welsh cheddar, grassy and nutty, and Hoja Santa, a mild, creamy chevre wrapped in hoja santa leaves. For something more substantial, you can order from the “small bites” menu. It includes some inventive dishes like bison tongue, sage quail, beet polenta and a traditional ploughman’s lunch. Or order their classic Welsh Rarebit, made with their Powerful Welsh cheddar melted with dark beer and poured over grilled sourdough. Oh my! From the long wine list, you can choose a flight of three 2-oz pours. There’s also a nice list of beers and ciders from local breweries. We lingered long, until we could no longer deny it was time to head back to my niece’s home 45 minutes away. And drove back wondering how soon we could come back again. For an even more complete look at this enviable eatery, check out my review of the Welsh Rabbit on theyums.com. 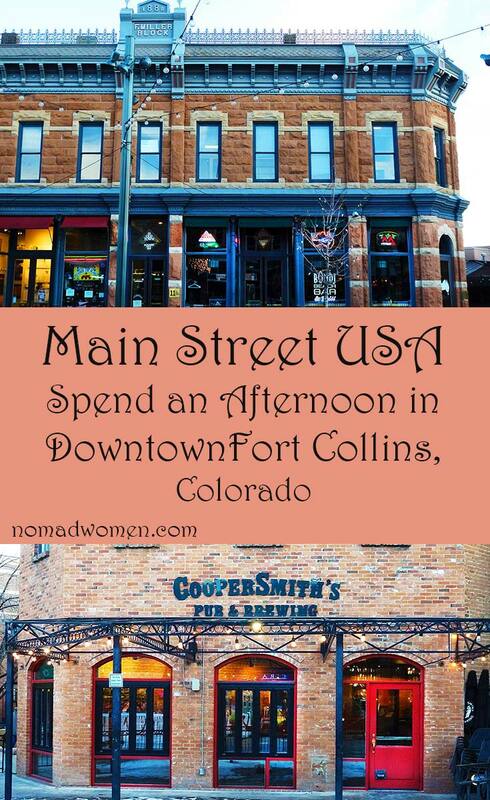 I hope I’ve convinced you to spend an afternoon in Downtown Fort Collins, Colorado the next time you’re in the area. It is a pretty, interesting and definitely filling way to add to your Colorado trip. Thanks, Doreen. I thought of you when I was in Nuance. Did you visit t? I loved talking o the owner. Great article! Also loved the beautiful photos! This city is a great place to explore. Thanks Nicole. It was fun seeing it with you and the whole group. Thanks so much for the kudos, Kristin. I think you will enjoy the detour. The food looks like it would be right up my alley. I had an OLD boyfriend who lived in Fort Collins, but we never made it there. Apparently, it is a great jumping off point for skiing in Colorado! Indeed it is, Vicki. And worth a stay on its own before or after hitting the slopes. We had a brief stop in Fort Collins last summer and really enjoyed it. Looks like we need to go back and do some more exploring looks like there lots of great food there. Thanks, Sue. Yes, the food and beer are pretty amazing. Worth a trip back. Fort Collins looks like such a fun place! I had no idea Disney’s Main Street USA was modeled after it. Very colorful stuff, but my favorite is those fabulous painted pianos! I loved the pianos too, Patti. As for Main Street, it was one of two towns used as models. Disney’s own hometown of Marceline, MO was one. Fort Collins was the hometown of his head designer. Colorado is a state that I NEED to visit! I love outdoor recreation and Fort Collins seems so close to great nature! I didn’t know it was so cute though too! And all these foodie places look awesome! It’s very close, Joy. Skiing, hiking, all sorts of beautiful Rocky Mountain scenery. You will love the whole state. You had me at the craft beer, but there’s so much more that appeals, especially the painted pianos and sipping chocolate. I kind of wish that I still lived in Denver so that I could hop over this weekend. Alas, I’ll have to wait until the next time I’m in Colorado, but hopefully that will be sooner than later. Thanks, Mindi. You guys would adore Fort Collins, if you’ve never been. So much graet food and drink! Do put it on your Colorado list. Thanks for showing off our great town of Fort Collins. We are very proud to offer unique dining experiences in a great downtown area that Disneyland modeled it’s Main Street U.S.A. after. On top of that, we love being able to escape the city and enjoy our outdoor activities just 15 minutes away in the foothills in the Rocky Mountains. Donna, you captured us perfectly and we appreciate it. You got most things correct-except for the college in this town. It is Colorado State University-not the University of Colorado which is about 50 miles away from Fort Colins. Thank you so much for the correction, Mary (and a couple of others). How embarrassing! Off to fix it right now. We spent a brief afternoon in Fort Collins and loved it. I agree that it’s a place we could live as well as just visit. A lot going on that makes it a wonderful destination. Indeed, Sue. I’d love to go back for more than just an afternoon. Fort Collins looks so beautiful. I have a client who is always going there for business trips and I love looking at the pictures he posts. I would love to go there myself. Do go if you ever get the chance, Alyssa. Besides the great downtown area, there are a lot of outdoor activities. It’s a beautiful part of the country. Fort Collins holds a special place in my heart as that’s where I met my now wife 20 years ago when I was ‘cruising’ old town. I met her in a parking lot near a half wall near Olive & Remmington and that’s where I proposed to her and now we take our 3 kids to that same spot every once in a blue moon to show them our spot. We live in Loveland just 15 miles south of that spot. When we were younger we used to spend a lot more time in FoCo… we need to come visit soon for sure.